Advertisements in content we consume, either through television, radio or online media is a fact of life. Content owners need some way to recoup the costs of providing the entertainment or other valuable information they are presenting to their constituency. However, a growing trend in the marketplace is for companies to have their online revenue streams disrupted by Ad blockers or ad fraud. 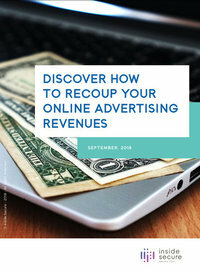 Discover how big an issue is Ad blocking to content distributors and how can Inside Secure help in protecting Revenue Losses due to Ad Blockers and Filters.